What is Best Free Image Converter? Best Free Image Converter is a very useful tool for image conversion, capable of batch converting the file format of images, supporting more than 20 formats including BITMAP, JPG, PNG, TIF, GIF, PCX, TGA, ICO, PSD, JP2, DCX, PDF, etc. Best Free Image Converter is capable of changing image attributes, such as color, quality, brightness, contrast, DPI, etc. Best Free Image Converter is capable of adjusting image size on scale or according to input value, and of rotating images. Best Free Image Converter is capable of adding custom watermarks to images and setting its size, location and transparency. It supports watermark file formats of BMP, JPG, PNG, TIF, GIF, PCX, TGA, ICO, PSD, JP2, DCX, and also supports transparent layer. Best Free Image Converter is capable of adding artistic frames to images. It includes default frames, and also permits users to produce frames of their own. 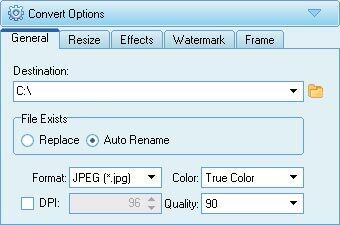 When setting parameters of conversion, users can preview the converted images or source images, capable of WYSIWYG. 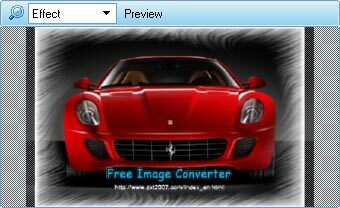 How to use Best Free Image Converter. Step 1: Select Source Files. 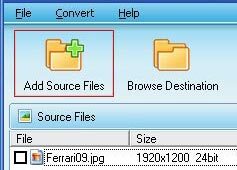 Click the button in the tool bar of “Add Source Files” to add source files to the list on the left side. Step 2: Set Convert Options. Select the folder of converted images to be saved in, decide how to rename the images, and then set the format, color, quality and DPI. Resize or rotate the images if needed. 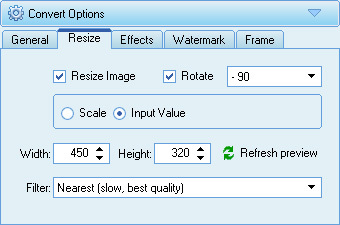 Users can select the sub-option of “Scale” or “Input Value” under the option of “Resize the Image”. If a frame has been set, the image may be improperly shown when previewed, requiring users to “Refresh Preview”. Change the brightness and contrast of images. 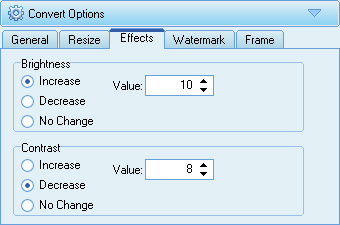 Users can select the sub-option of “Increase” or “Decrease” under option of “Brightness” or “Contrast”, then input the value as desired. 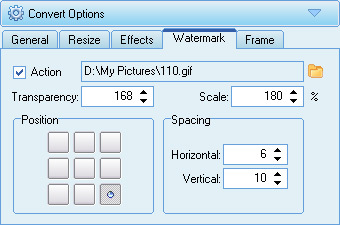 Set watermark and adjust its size, location and transparency. If the watermark is too small compared to the source image, it can not be seen when previewed. When this happens, user should adjust the size of watermark, or reselect another watermark. User can select default frames, or create custom ones. Select the option of “Custom” in dropdown, and then click the button on its right to pick custom frames. Step 3: Start Convert. Click the “Start Convert” button. Preview. 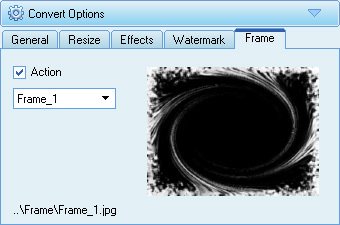 Users can preview the images by selecting Effect or Source in the dropdown.